Kurt of Gerolstein: "A Piratical Maid of All Work"
Why am I writing about Emily Cross? Surely she’s been written about enough. She even wrote her own memoirs in the Newcastle Daily Chronicle, although sadly I haven’t been able to find them: only a selection. ‘Emily Cross’ was her real name, there is no mystery about her background, her marriage, her children, so … why tackle her? Well, I just wanted to. Because her tale, in this day and age has got somewhat distorted. Not perhaps the facts (some of them) but the emphases. I mean, you would think that the main, or indeed the only, thing of worth that she did was to play the first performances of Ruth in The Pirates of Penzance on the London stage. And that is nonsense. She actually created and played more or less important roles for as long or longer than Ruth. Anyway, no comparisons, just read on. Around 1849, the family removed to St Peter Port in Guernsey (no, she wasn’t born there either!) where Ben, so the 1851 census says, worked as a ‘bath chair keeper’. In 1861, he is a ‘cloth manufacturer’, the boys are ‘a baker’ and ‘a potter’ and Emily is, already, ‘professor of music’. It was in the Channel Islands (not in Newcastle) that Emily made her first appearances as a teenage vocalist. 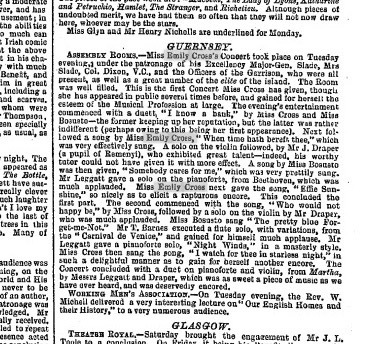 I have the review of one concert, attended by the local great and glorious, given by the young aspirant, which says that she has been heard in public previously … and in her memoirs she quotes the Messrs Arscott’s concert at the Working Men’s Club. So be it. Very soon after the 1861 census, 15-year old Emily got a job. I don’t know how (but apparently courtesy of her singing teacher, a Mr Leggatt), but she was hired by (‘apprenticed to’) Mr Edward Dean Davis, actor-manager of the Newcastle Theatre Royal company, at far-off Dumfries and Newcastle. And the family, or at least Emily and mama to start with, moved north. Well, I first see her 1 September 1862 ‘of Dumfries and Jersey’, performing at Newcastle. And billed! ‘Teacher’s pet’ is giving songs between the shows, behind Henry Loraine and Mrs Charles Calvert’s dramatic performances. Opening night, As You Like Itwas played, and Emily joined a quartet to sing ‘God Save the King’ and ‘Partant pour le Syrie’. And to make her second acting appearance – for, yes, she tells us that her first was at Dumfries, where she jumped in one night for an ailing actress. The Miller and his Men was played as afterpiece to the Shakespeare, and Emily played a small boy’s part. Another young actress/vocalist, Madame Juanita Garcia, who had recently debuted as Nora in The Poor Soldier at the Surrey, was also in the company and the quartet, and she too sang, alternate nights, between the shows, but it was Emily who go the attention, with her ‘Merry is the Greenwood’, ‘Come into the Garden, Maud’, ‘Kathleen Mavourneen’ and ‘La Manola’ (‘an attractive person and an excellent voice … encored’). It is October before I spy Emily billed in the press to play a role. James Anderson was guesting as Macbeth, and Emily sang the bass role of Hecate. And from then on, for more than four years, under the wing of Mr Davis, she was a featured favourite on the Newcastle stage. When the Nelson sisters visited she played the Fairy Queen in Conrad and Medora, she teamed with Lady Don as Balroubadour in Aladdin, Lemuel in Perdita, and doubtless as Di Vernon to the Lady’s Osbaldistone in Rob Roy. She was Lucy Marjoribanks in Lord Dundreary, Dandyni in Cinderella with the Lupinos, Nina in The Morning Call, Georgina in Our American Cousin with Sothern, Di Vernon with a more conventional Osbaldistone in Maurice de Solla, and with ‘Professor Anderson’ as Rob Roy, Sam Willoughby in The Ticket of Leave Man, Amy Robsart in the burlesque of Kenilworth, the Spirit of Mischief in the panto The Fairies Frolic with Fanny Addison, took the title-role in The Little Sentinel, Mary in The Marble Heart, the Duke de Gonzauge in a burlesque of The Motto, Lilac Lovel in The King’s Wager, Ada Ingot to the David Garrick of Sothern, Apollo in Ixion with Jenny Willmore and with Edith Challis as Venus, through end to end seasons, and there was general mourning amongst Novocastrian playgoers when it was announced that she was leaving. She was going to Drury Lane. Emily’s ‘first appearance in London’ is oft quoted. In fact, it was a bit of a mess. The cast announced for Rob Roy for 16 March was topped by Sims Reeves as Osbaldistone, Phelps as Nicol Jarvie, and Powrie at the outlaw, but it didn’t happen. Mr Reeves, for the thousandth time, was ‘ill’. It finally got on a week later (23 March), with Reeves hurriedly replaced by William Harrison. The Era reported ‘a debutante whose claims to favour are of a strong kind. Very prepossessing in person and manner, her acting is easy and graceful and her reception was of the most cordial description. She sang the usual songs with much taste and expression and has a sweet voice of no great power but which she manages with considerable skill. Her first introduced song was encored, and in the unaccompanied duet with Mr Harrison, ‘Though you leave me now in sorrow’, and ‘A Highland Lad my Love Was Born’, Miss E Cross established her position with the audience..’. ‘The Diana of the play is the palest possible reflex of the Diana of the novel. Miss Cross, however, infused new spirit into the performance, and threw a grace of her own round the part. Her voice is a full, round mezzo-soprano, and her singing proved that her voice had been turned to no indifferent account. She sang ‘From Morn to Eve, so bonny-O’ and ‘John Hielandman’ and was encored in both.’ ‘sang so prettily and acted so well as to become a favourite with the audience’. Those who quibbled found her performance insufficiently ‘large’ for a theatre accustomed to ‘large’ acting and loud singing. Powrie had an accident on opening night and had to be replaced by Swinburne for night two … but the hamstrung cast played their drama every night for three weeks. When manager Chatterton later sued Reeves for broken contract, it came out in court that it was the tenor who, Louisa Pyne being unavailable, had been responsible for Emily’s hiring. And that she had been hired specifically for that one role, specifically to play opposite him! Rob Roy, her Drury Lane (and Chatterton’s Benefit concert) contract over, was swiftly on her way to other major engagements. The first was at Liverpool where Phelps was to play Bottom in A Midsummer Night’s Dream with burlesque boy Julia St George as Puck. Emily was cast as Oberon and ‘created an immense impression by the superior nature of her vocal qualities’, scoring an encore for ‘I know a bank’ with Miss St George. She played with the Wigans in The Poor Noblesse and The First Night, and when manager Alexander Henderson’s Benefit came round she actually played opposite him (not known as an actor!) in The Leap Year, and with David Fisher in the little Planche piece called Somebody Else. She had just time to pop back to her old haunt in Guernsey for a concert at Clifton Hall, before it was on to Mr Chute for the opening of his new theatre at Bristol (14 October). The Tempest, with James Bennett as Prospero was the opening attraction, and – cast in yet another Priscilla Horton role – Miss Cross was Ariel. She stole the show: ‘one of the choicest bits of acting we have seen’ ‘It is but rarely that we hear such vocalisation on the stage’, ‘beautiful singing’ … and Chute promptly mounted Rob Roy, and The Little Rebel, Loan of a Lover, Macbeth (Hecate) and Hamlet with Emily as Ophelia, before bringing out, again, Rob Roy. Emily repeated her Diana to the Osbaldistone of a future singing star in ‘Frank Crellin’ (later to be ‘Celli’). Extending her engagement, she starred in The Colleen Bawn (with songs), played Josephine in The Child of the Regiment, and played principal boy in the Christmas Aladdin, until she had became as great a favourite in Bristol as she still was – her every move followed by the local press – in Newcastle. Shortly after, she was recalled to Bristol for a special engagement as Julia in Guy Mannering. Chute himself played Dandie, G F Rowe was Sampson and the hero was… Sims Reeves. She returned north for 12 nights at South Shields (2 March 1868) and also to get married. Her husband was a Newcastle man, [Mark] Ernest Jobling, son of a local solicitor and later a mining engineer. They would have some 35 years of married life together. In spite of reports that she was headed back to the struggling Chatterton and Drury Lane, when she returned to London in June it was under slightly less glamorous circumstances. She was engaged to repeat her Ophelia at the Princess’s Theatre. Two circumstances were against her. The Hamlet was a ‘gentlemanly, amateurish’ actor named Allerton (who, I suspect, was the money behind the affair), and Emily was pregnant. She was judged just ‘pleasing’. She gave birth to a daughter, Lily, recte Agnes Lillian slightly too soon, in the privacy of Bodmin, Cornwall, 13 October 1868. She returned to the stage under the management of Charles Calvert, at the Prince’s Theatre, Manchester at Christmas, playing in Goody Two Shoes (‘simple, fresh and unaffected a voice which if not very strong is particularly melodious’), and then at Easter returned to roots, and Mr Davis, for another run at Newcastle, Carlisle and Edinburgh. No juvenile now, she was a confirmed star and leading lady – The Tempest, The Ticket of Leave Man, Man of the World with Phelps, Desdemona, Rosalind (‘The Cuckoo Song’, ‘When Daisies Pied’), The Chimney Corner, Richelieu, Lady Teazle, Lady Gay Spanker, The Fool’s Revenge once more with Phelps, Ingomar, The Porter’s Knot … and then Liverpool for Christmas, as Jack Frost in Queen Bee (‘acted and sang in a style seldom witnessed in this kind of performance’). Manager: Mr E D Davis. 1870 was spent, again, largely with Davis, largely in Newcastle, largely en famille, and in March 1871, a second child, a son, Ernest Nathaniel Lambert Jobling was born. The baby was put in the care of a nurse while Emily continued to follow Davis to Blyth, York, Whitby, Sunderland and back to Newcastle, but 21 August 1871 small Ernest died, aged 5 months. Emily carried on. Trouping around the north with Davis playing everything from East Lynne to The Colleen Bawn, The Power of the Heart and Charles II, to a musical comedy drama written by Cunningham Bridgman, with music by one amateur Frederic Clay, a Mr Liddell and .. tiens! .. Mr W A Leggatt of Jersey, now widowed and living in Alnwick. Shipmates was produced by Davis at Sunderland (1873) with Emily featured and making a success of a Clay song ‘Lover Mine’. In 1874 a second daughter, May, was born. Emily seemed to have given up theatrical ambition for family life, and her appearance over the next years were almost all in the north. She took to appearing as a guest with amateurs, and I spot her only rarely on the London boards, playing Twelfth Night for Charles Wyndham, Hamlet at the Park Theatre with Creswick and Fanny Huddart, Guy Mannering at Alexandra Palace with Foli, Gertrude Cave-Ashton and Wilford Morgan replacing, guess who, Sims Reeves (20 May 1876), as well as giving her Diana Vernon at Liverpool. When the famous Compton Benefit Trial by Jury, with its cast of celebrities was given, in March 1877, Emily was amongst the starry bridesmaids. Again, a pregnant bridesmaid. 22 May 1877, at 19 Scarsdale Villas, London, she gave birth to her third daughter, Emily Alice Jobling. So, now we get to the bit that everybody knows. Emily took a job at the Opera Comique, where the comic opera HMS Pinafore was being produced. She wasn’t cast in the main piece, but she played the little forepiece as Mrs Nankeen Worcester in Cups and Saucers with Richard Temple and, so it seems, as usual in such situations, covered the ladies’ roles in the principal attraction of the evening. I see that, during the run of Pinafore she deputised not only for Harriet Everard as Buttercup, but also for Emma Howson as Josephine. 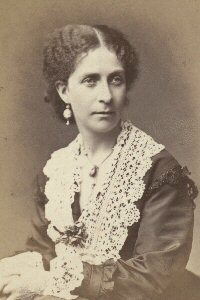 At Christmas 1879 she was engaged at Bradford playing Queen Lucidora opposite the eternal Carry Nelson, but she was back in town in the new year when the incident occurred that would propel her into a new London role. Harriet Everard was injured in rehearsals for The Pirates of Penzance’s London production, and it was the ever-useful Emily who was called on ‘pro tem’ to introduce the role of Gilbert’s ‘piratical maid of all work’ to London. The opening night reviews mostly concentrated on her ‘jump in’ rather than her performance (‘acquitted herself remarkably well’ ‘much spirit and drollery’) but Emily proved herself more than just a jump-in, and played the role of Ruth for several months before Miss Everard and Alice Barnett took over. The management presented her with a suitably inscribed bracelet of thanks. I wonder where that is now. She appeared in some more Bridgman pieces (Lovers’ Knots, Satisfaction ‘mirthful and vivacious), visited Bristol again, played with amateurs again, appeared in an unfortunate comic opera entitled Lola, and was hired again by the W S Gilbert team for John Hollingshead’s revival of Princess Toto. Once again, she shared the forepiece Quid pro Quo, this time with George Temple. When the brief run of the comic opera finished, however, Emily stayed on at the Opera Comique. She was cast not only alongside George and Richard Temple and Robert Brough in Lovers’ Knots, but in the main play, in the character role of Mrs Pounceby in George Sims’s hit comedy The Mother-in-Law with its Aesthetic Quadrille. Emily appeared sporadically over the early 1880s both with amateurs (Portia, Rosalind etc) and professionally, now in character roles (Duchess of Breeks in An Adamless Eden, Seraphine Lovering in Doctor D), before in 1886 she was cast in the production of Pinero’s The Schoolmistress at the Court Theatre. It was the same story again. Cast in the supporting character role of Mrs Admiral Rankling, she again jumped in for a significant period for Mrs John Wood in the title-role of the hit play during its 10-month run. Her new ‘fach’ as a character lady, playing vinegarish spinsters was established. And then Emily’s name went missing from West End bills. Why? She was in Italy, with her daughters, to give them an ‘Italian’ musical education. And Lily turned into ‘Agnes Giglio’. Yes. The other two remained ‘Elsie Cross’ and ‘May Cross’. Back in England, Emily joined Mrs Langtry’s company at the Haymarket for The Queen of Manoa (‘a most amusing depiction of an amateur recitress’), took part in a brief piece by the faithful Rutland Barrington (Bartonmere Towers), and did one more of her ‘saving the furniture’ acts when, cast in a supporting role in Pinero’s The Amazons, she succeeded to the star role when Rose Leclercq departed. She played at Terry’s Theatre, the Garrick and with Olga Nethersole’s company, travelled to New York with Beerbohm Tree’s troupe, staged a wee piece Lady Dorothy’s Scheme with her three daughters at Newcastle, then joined Elsie in Barrington’s unsuccessful attempt to the revive the German Reed entertainment. Once again Emily took a Priscilla Horton role – if one from a later era -- as Daphne in Happy Arcadia. In 1895-6 she played at Terry’s Theatre, as the schoolmistress, Miss Romney, in The Strange Adventures of Miss Brown, and then as the sour Mrs Jedbury in the over a hundred nights of Jedbury Junior. Her last musical engagement was as Mrs Wapshott in the disappointing Belinda, and it seems that her last London appearance was with Lena Ashwell in Louis Parker’s Mayflower at the Metropole, Camberwell in 1899. All three daughters had, by now, ventured on to the stage. ‘Lily’ (who tried being ‘Lily Ernst’ when she wasn’t ‘Agnes Giglio’) appeared in concert, the musicals The Baroness and The Venetian Singer and played Emily’s role of Di Vernon in a Scottish tour of Rob Roy before visiting South Africa (‘of Covent Garden fame’) where she married surveyor Edward Hopper (Cape Town 27 December 1895). She died 4 May 1961. Her son, Humfrey (sic) Greenwood Hopper, RN Captain, DSO, Croix de Guerre, RHS (1898-1992), had a distinguished naval career. ‘Elsie’, after a few years as an ingenue (The Geisha, Trilby, German Reed entertainment, Lost Stolen or Strayed, The New Barmaid, My Soldier Boy), married Charles Heyward Pitts-Tucker, lawyer (17 June 1899), and settled in Barnstaple, where she died in 1957. May (‘Mary’), after appearances in several London musicals (His Excellency, The Kangaroo Girl) and touring plays (Trilby) wed engineer Arthur Lipscombe Begbie and died 1 January 1954 in Barnes. Emily herself had more or less given up performing when she died, while on a visit to Elsie, in Barnstaple 4 January 1904. She was long survived by her husband, who died only 12 December 1921 at Port Sonachan in Argyleshire. So, Emily Cross, actress, had a career of nearly forty years, of which her engagement as Ruth in The Pirates of Penzance was only one item. In her later years, she became favourite casting for spinster schoolmarms and acidulous Duchesses in the works of such as Pinero, but it is as Ruth, rather than that or her early acclaimed Shakespearian work that she is remembered.